Boston Blackie, the suave crook-turned-detective created by pulp writer Jack Boyle, had been popping up sporadically in films for nearly two decades by the time Columbia launched its “Boston Blackie” series in 1941. Chester Morris stars as the title character, Horatio “Boston Blackie” Black, as a former professional thief now working as a sort of freelance adventurer/detective. Blackie, just barely on the right side of the law, preferred not to get too involved with the police. “Meet Boston Blackie” is the first of fourteen Boston Blackie films that began the new adventures of Boston Blackie. The series evolves Blackie from a thief and underworld criminal into a new character that turns out to be very interesting and entertaining. Richard Lane, who plays Boston’s long-suffering Inspector Farraday, was the only other character in all fourteen of the Boston Blackie movies. George E. Stone, playing Blackie’s sidekick, his dim-witted crony The Runt, was not in the first or last film but was in all the others. Charles Wagenheim played The Runt in the first film and Sid Tomack in the last. Another of the reoccurring fun characters is the irrepressible Arthur Manleder, the adventurous millionaire played by Lloyd Corrigan in some of the films. Boston Blackie was one of Columbia’s most profitable film series. 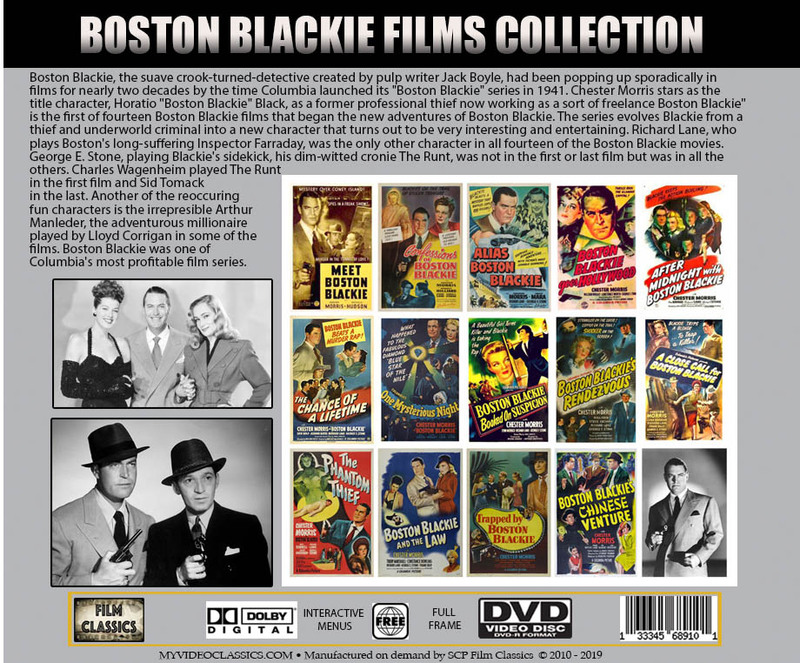 Meet Boston Blackie (1941) This is the first movie in the Boston Blackie series. Boston Blackie tangles with mystery, women and murder to smash a foreign spy ring in a Coney Island freak show. Confessions of Boston Blackie (1941) Boston Blackie is on the trail of stolen treasure and gets caught up in a crossfire of bullets and women. Alias Boston Blackie (1942) Blackie tracks down an escaped convict so he can prove the man is innocent. Boston Blackie Goes Hollywood (1942) When he’s framed for robbery, a reformed thief takes off to find the real culprit. After Midnight With Boston Blackie (1943) A reformed thief gets himself arrested fetching some jewels for a friend. The Chance of a Lifetime (1943) An ex-thief helps some fellow ex-cons adjust to life as defense workers, only to get involved with a robbery investigation. One Mysterious Night (1944) Blackie, wipe that smile off your face. You have an appointment with death. Boston Blackie Booked on Suspicion (1945) A reformed thief accidentally sells a phony first edition of Dickens, which triggers a murder. Boston Blackie’s Rendezvous (1945) This is the ninth in the Boston Blackie series and is considered one of the best. Blackie hunts for an escaped lunatic on a murder spree. A Close Call For Boston Blackie (1946) Blackie is framed for murder by a beautiful dame. The Phantom Thief (1946) Murder, stolen jewels, sinister seances, ghostly apparitions and Blackie trying to stop a murderous blackmailer. Boston Blackie and the Law (1946) A reformed thief brings a magic show to a woman’s prison and gets mixed up in an escape. Trapped by Boston Blackie (1948) When a friend is murdered, Blackie helps the widow keep the family detective agency open by volunteering to work guard duty at a society party…little realizing he’ll be blamed when a valuable necklace is stolen! Boston Blackie’s Chinese Venture (1949) Blackie is seen leaving a Chinese laundry where the proprietor has been murdered, and must track down the real killer in Chinatown. 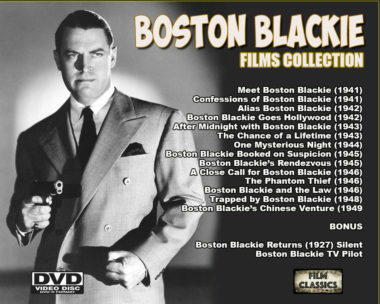 This is the best produced set of the Boston Blackie series of 14 movies starring Chester Morris in the title role. I already had all the movies in other sets or single DVDs but this set contains the best audio/video quality I have seen. This special set also includes the rare silent classic “Boston Blackie Returns” (1927). If you are a serious collector of these old classic movies then this set is a must have – highly recommended. Loved this collection. The discs are packaged in a multi-CD clamshell case, with linen-lined plastic sleeves on a ring binder. The lining on the sleeves keeps the discs from getting scratched and makes them easy to slide in and out. I highly recommend these enjoyable movies in this attractive and economical collection.